CCI Cleaning Connection, Incorporated provides janitorial services, hard floor maintenance, carpet cleaning, restoration and a host of other cleaning options to commercial and residential customers. We offer a fully trained staff and our business is certified by the Institute of Inspection, Cleaning and Restoration Certification (IICRC). We started our company in May of 2003 and incorporated on November 1, 2003. We are family owned and operated. Our office is located at 1107 Locust Street in Chambersburg, Pa.
Our goal is to provide our customers the highest quality services available while maintaining reasonable rates. We believe that "VALUE" isn't always paying less, but rather always getting what you paid for. All of our services are backed by our 100% Satisfaction Guarantee. We look forward to serving you in the near future. 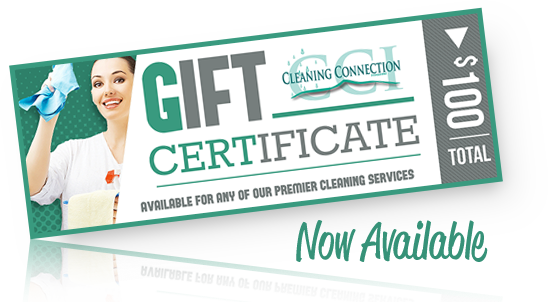 Gift Certificates for any of our services.